These were tobacco advertisements lithographed onto silk. They were also called “cigarette silks,” and many were printed on satin. They were popular until into the 1920’s. 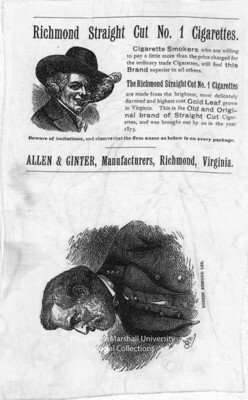 This example shows a lithograph of Robert E. Lee, with an ad for Richmond cut cigarettes. It was printed in Richmond, Va., in 1875. Item # 2006.0703.225, 24 x 15 cm.